The Volquartsen MKIII Magazine Extender is CNC machined from an aluminum alloy and comes in a matte black anodized finish. The Magazine Extender is designed to aid the shooter when changing magazines. It was designed with the Volquartsen target grips in mind. The Volquartsen grips extend down below the grip frame which can prevent rapid insertion of the magazine during competition. Not only does this aid in rapid insertion but it also gives the shooter a nice base to grab the magazine out of the frame for easy removal. No more having to �pry� on the magazine to get it released. Whether you are using Volquartsen target grips, factory grips or any other aftermarket grip and are competing in timed events, this part is a must. 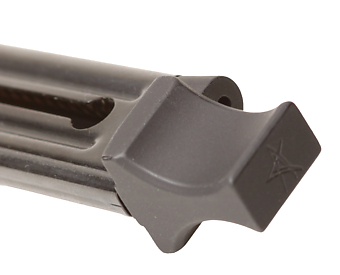 The Volquartsen MKIII Magazine Extender is designed to fit the Ruger MKIII (excluding 22/45) factory magazine only. This item is not compatible with the Volquartsen MKIII MagLatch.